The Bread Pedaler made its debut on August 24th, on the corner of Water and Orange Streets. 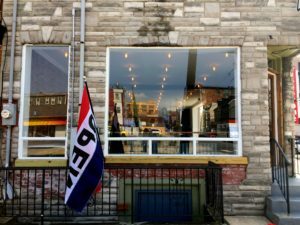 This new restaurant, open Tuesday through Sunday, 7 am to 2 pm, puts a unique twist on a regular brunch place. The moment I walked in, I was greeted with a warm smile, a “how are you?” and most importantly, the menu. Customers order at the counter, take a seat, and warm food is brought out to the table. At first glance, the menu may seem small, but, in fact, it contains a variety of breakfast and lunch options for everyone from meat-lovers to vegans. The menu contains breakfast sandwiches, breakfast bowls, breakfast tacos, topped toasts, sandwiches and salads. Keeping with the bread theme, the restaurant sells bread by the loaf, both fresh as well as day-old for a discounted price. You can’t fail to notice the large stacks of loaves of bread above the kitchen, visible when you first walk in. The restaurant’s set-up and design aspects are some of the things that set it apart from your average brunch place. The aesthetic is a modern, clean look with some rustic accents: hardwood floors, wood paneling and wooden tabletops. A white ceiling speckled with exposed light bulbs adds to the atmosphere. A large window, complete with window seats looking out onto Orange Street and bringing in a lot of light to the restaurant, creates a feeling of continuity with the street. One of its claims-to-fame is that all ingredients are fresh, locally-sourced, and organic. The layout of the restaurant provides a look into the exposed kitchen (something fun to watch as you wait for your food) which also reinforces the idea of truly fresh foods made right in front of you. Another striking aspect of the restaurant is the drink storage. Instead of a typical soda fountain, there is one big cooler—on the right when you walk in—that contains bottled sodas, orange juice, teas, and water. The other drink option was coffee, which I was excited to try. The area was carefully set up with mugs and glasses lining shelves above a counter and dispensers for both hot and iced coffee. There was vanilla syrup, cream, sugar, and everything you might need for your coffee thoughtfully placed in small containers. I ordered coffee, which was robust and delicious, and a Mediterranean Bowl, which came to my table a few minutes later. I was immediately pleased with my choice because of the perfect sunny side up egg, two pieces of toast and fresh vegetables. I broke the yolk over the bowl—full of tomatoes, spinach and kale, halloumi cheese, tapenade (an olive paste), and tzatziki sauce—and dug in. The ingredients tasted fresh, and the toast was exceptionally good, but I was most pleasantly surprised by the amazing flavor of the meal due to the tapenade and tzatziki sauce; I’d definitely recommend trying this one! After I finished my meal, I decided I needed to come back because there were so many more options I wanted to try on the menu. The atmosphere is laid back with music playing, perfect for an off-campus weekend brunch with friends or a fun study group meeting. If you try The Bread Pedaler, you won’t be disappointed! First-year Danielle Rice is a contributing writer. Her email is drice1@fandm.edu.